I have been wanting to make home made ravioli's for a very long time. I kept thinking that I would buy a pasta machine, get the molds, and on and on and on. I will someday have those things, but for right now I must do it by hand or the old fashion way. No molds and no pasta machine. I like getting my hands in the dough and playing in the flour. This does take some time to prepare, but it is so worth the time and effort to make a good ravioli. My family absolutely fell in love with these little morsels of heaven. I will be making this again and trying some different fillings. I would love to try a combination of spinach, mushroom and cheese. If serving the ravioli with the marinara sauce. Make this first, it is listed below. You will need your favorite pasta dough. The filling listed below will make about 40-50 ravioli’s, depending on how large you make your squares and how full you stuff them. If you need a recipe, The Pioneer Woman has an excellent step by step recipe that can be found here with pictures. It is amazing! I use a gluten-free pasta dough that is wonderful and taste amazing. I never have any problem with it and can role it very thin. That recipe can be found here. Mix all of the above ingredients together and set aside while you roll out your pasta dough. Take a large pot and fill with water. I would add about 10-12 cups of water. I also add 1 tsp. of olive oil to the water. For the dough: I flour my work surface and rolling pin. I cut my dough into small sections. 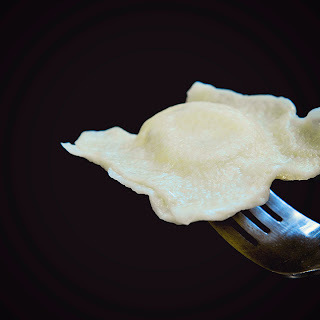 You want equal sections so that you have a top and bottom piece to make your ravioli. Shape your dough like a rectangle (2 short ends/2 long sides). I roll the dough out very thin. I roll out the first one, pick it up and set it on a cookie sheet. Roll out the second piece of dough. I use a cookie scoop to scoop my filling and space them apart on my second piece of dough. I like my ravioli about 2 X 2. I can sometimes get three rows across, but usually just 2. Once you have placed your filling, grab the first rolled out dough and lay it on top of the second. I use my fingers and gently push the top down around the scoops. I don’t have a ravioli cutter (this is a round or square tool with a handle). I use my pizza cutter and cut the rows of filling into squares. You will cut long ways and then cut across, forming individual squares or ravioli’s. 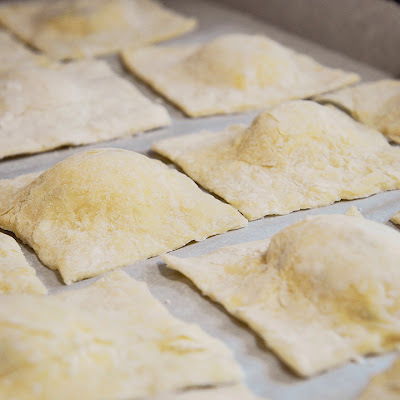 You want dough around the ravioli so it does not fall out during boiling. I have a cookie sheet lined with parchment ready for me to place each ravioli on. When I pick up the ravioli, I like to pinch the edges to make sure they are sealed. The pizza roller does not always seal them, like a ravioli cutter will. If they need to be sealed, I part the layers on the edges brush some water in between and pinch again. I usually lose one or two fillings in the boiling process. The ravioli’s will sink to the bottom of the boiling water and rise to the top. I cook my ravioli’s about 6-7 minutes. I want the filling to be warm, the noodle cooked and the cheese starting to melt. 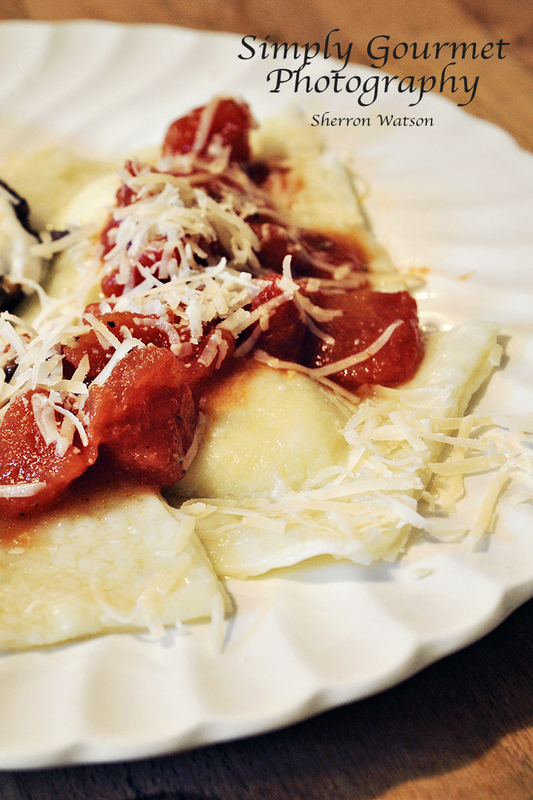 I transfer the ravioli to a large plate, sprinkle with cheese and serve with the marinara. FOR GLUTEN FREE DOUGH: Use white rice flour when rolling out the dough. Starch is too slippery and will change the color of your dough. I served the ravioli's with a homemade Marinara Sauce. Combine all ingredients into a small sauce pan. I have the heat set at medium. Once the marinara starts to bubble, turn the heat down to low. I like for this to be simmering while I am making the ravioli's. I think the longer it simmers the more the flavors have a chance to meld. I like the tomato chunks in my sauce, if you do not, then you can cut or mash the tomatoes so they are not so big. Salt is a tricky thing with tomato sauces. Some people like very little and others a lot. I always start out with 1/2 tsp and do the : taste, add, taste, add..method. It is a personal choice of how salty you like your food. It's always easier to add more then it is to start over because you over salted something. 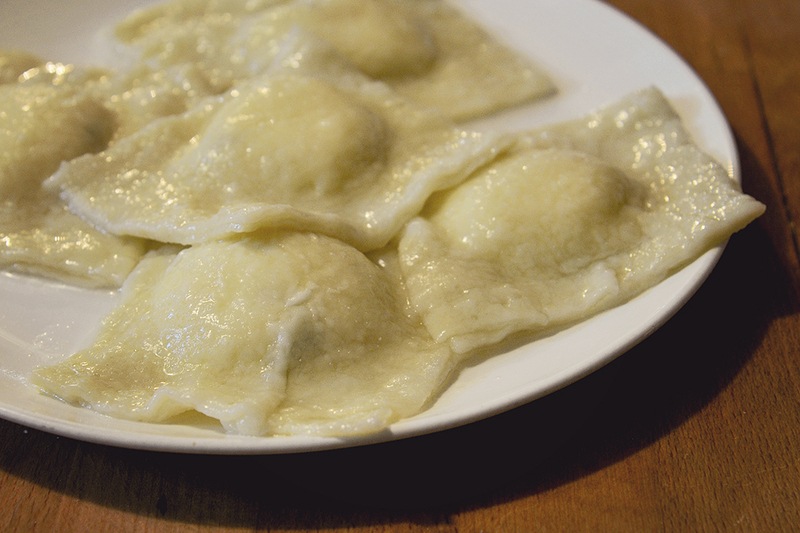 i love ravioli and made him at home from scratch only once. It was touch and tiring as I had to using a rolling pin. But at the end it was so worth the effort! This looks so delicious. Asiago cheese is my favorite! I'll bet these are fabulous! !